WASHINGTON, DC, December 30, 2015 (ENS) – The same storm system responsible for the extreme weather that claimed 43 lives in seven states over the past week has caused temperatures to rise about 50 degrees Fahrenheit above normal at the North Pole today. 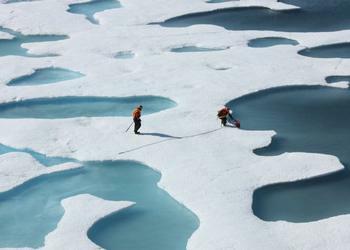 Temperatures at the North Pole are normally about minus 20 degrees Fahrenheit at this time of year. But today the North Pole experienced a high of around 35 degrees Fahrenheit, a few degrees above freezing, a temperature that’s “unheard of” there during winter months, said ABC News meteorologist Melissa Griffin. The storm system forcing warm air to the North Pole is the same storm that spawned recent tornadoes in Texas and heavy rain and flooding across the Midwest and Southeast, Griffin said. 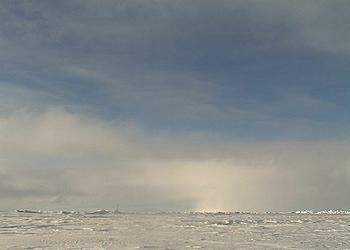 There are no permanent weather stations at the North Pole. Scientists rely on weather forecast models, which gather data from satellites and surrounding surface observations, to estimate conditions at the pole. This morning, temperatures to the east of the North Pole ranged from 30 and 35 degrees Fahrenheit, surpassed the 32-degree freezing level at exactly 90 degrees North, according to data from the Global Forecast System, a weather forecast model produced by the National Centers for Environmental Prediction. A temperature reading near freezing indicates a 50 degree variance from normal, close to average mid-summer temperatures at the North Pole. A NOAA-sponsored report released December 15 shows that air temperatures across the Arctic this year were well above average with temperatures over land more than two degrees Fahrenheit above average, the highest since recordkeeping began in 1900. Increasing air and sea surface temperatures, decreasing sea ice extent and Greenland ice sheet mass, and changing behavior of fish and walrus are among key observations released today in the Arctic Report Card 2015. “Now in its 10th year, the Arctic Report Card is a key tool to understanding changes in the Arctic and how those changes may affect communities, businesses, and people around the world,” said NOAA Chief Scientist Dr. Rick Spinrad. Some 70 authors from 11 countries, including U.S. federal agencies and academics, contributed to this annual peer-reviewed report, guided by an editorial team from the Office of Naval Research, the U.S. Army Corps of Engineers’ Cold Regions Research and Engineering Laboratory, and NOAA. In 2014, and for the first seven months of 2015, the Arctic Report Card shows combined discharge of fresh water from eight Eurasian and North American rivers into the Arctic Ocean was 10 percent greater than the discharge in the decade of 1980-89. Scientists attribute the rise in discharge to increasing precipitation linked to global warming. 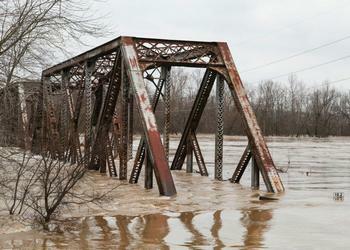 Rising rivers are causing serious problems across the continental United States as well. Major flooding is occurring or forecast on the Mississippi and Ohio rivers their tributaries in Missouri, Illinois and Kentucky, with record flooding at several locations, according to the National Weather Service. Missouri Governor Jay Nixon activated the National Guard on Tuesday to support emergency personnel and protect communities from the historic winter floods. Dr. Jeff Masters of Weather Underground says the Mississippi River at St. Louis would crest on Wednesday at the second highest level ever observed, five feet below the all-time record set the flood of 1993. River stages on the Missouri, Mississippi, and Illinois Rivers are above flood stage and several gages including those at Valley Park, Missouri are forecast to set records, according to the U.S. Army Corps of Engineers. A five-mile section of the Mississippi River near St Louis has been closed to vessels as rising water levels caused “hazardous conditions,” the U.S. Coast Guard said. Major flooding is also occurring on the Arkansas River and its tributaries in Arkansas. Floodwaters will move downstream over the next two weeks, with significant river flooding expected for the lower Mississippi into mid-January, forecasters say. Deadly tornados have devastated parts of Louisiana and Texas. In Garland, a suburb of Dallas, eight people died Saturday when an EF-4 tornado touched down, the National Weather Service Fort Worth survey team said. EF-4 tornados whip up winds that travel 165 mph. But relief is on the way. AccuWeather reports the storms will take a break across the nation as colder air expands southward and eastward for New Year’s Eve and New Year’s Day.